In this new year Dena Weiss, Hadar's Rosh Beit Midrash, will share thoughts on the Torah portion though a weekly D'var Torah. To receive these in your inbox please sign up below. 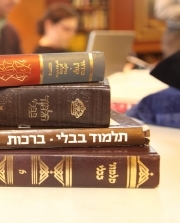 Every week, we send our divrei Torah, live lecture recordings, Responsa Radio episodes, and online classes through our podcast feed so you can receive them directly to your application or device. Use the links below to sign up. Sign up for Project Zug! Looking for online learning? Sign up for a Project Zug course, an online learning platform powered by Hadar.